Last weekend found a couple of our members falling in with "The Dark Side"! 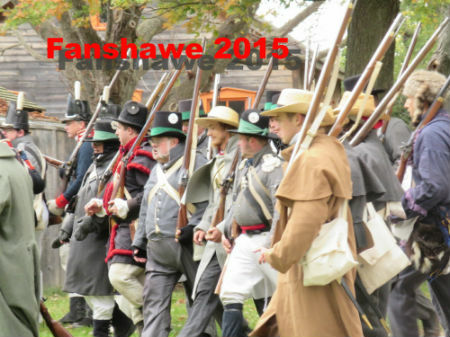 From all reports, the view of the battles at Fanshawe Pioneer Village, from the Canadian Volunteer perspective are a lot different from the Redcoat view! We would like to thank Phil Edwards and the Canadian Volunteers for taking such good care of our guys - and for giving them back! Three of our brave members, one recovering from a broken ankle, made the 8 hour journey to the Battle of Mississinewa in Marion Indiana on thanksgiving weekend. The event is very well attended and any redcoat presence is very welcome. 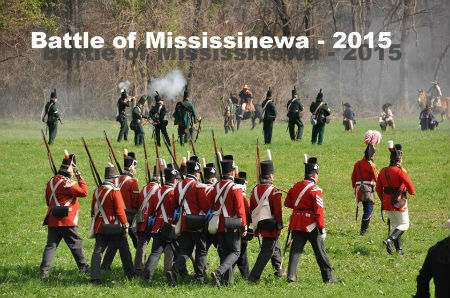 Mississinewa rounds out our re-enacting season. After this, kit and accouterments are cleaned, repaired and stored for the winter. We were able to get some pictures to post c/o Deb Brown! Deb always gets the best shots! !